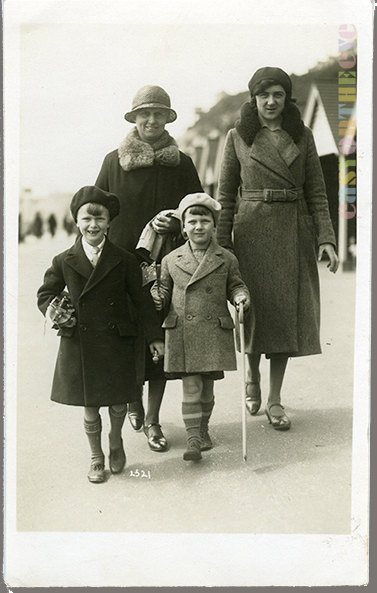 Bailey’s took walking pictures in Bournemouth during the 1920s at least until WW2, although they were involved in all aspects of seaside souvenir photography. The business was founded by Ernest Benjamin Bailey who worked originally an accountant when he moved to Bournemouth, but had a passion for photography. The earliest dated example of his work I have is from 1918, marked Studio, 242 Old Christchurch Road, and 1920, sold under the name of Bijou Snaps from 242A Old Christchurch Road, but other collectors report cards from as early as 1914 (if so he perhaps had to wait until the end of WW1 to carry on the business). There is also a card marked Bijou Snaps from an address at 10a Norwich Avenue. 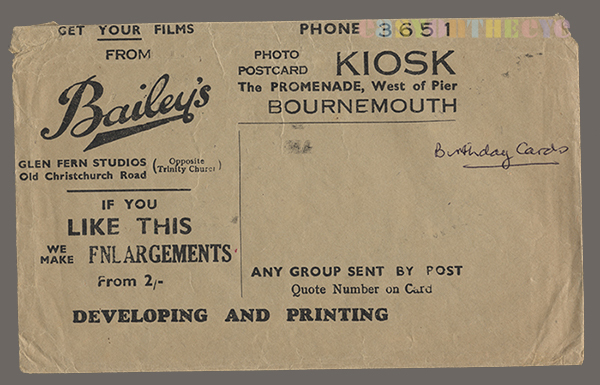 Cards from 1921 are simply marked Bailey, photographer, Bournemouth, but by 1923 he moved a little closer to the town centre with a studio at 228A Old Christchurch Road. Business must have been good, because he soon moved again, to more salubrious premises at 2 Glen Fern Road (just off Old Christchurch Road) in a Victorian villa. From then on his cards were marked Bailey, Glen Fern Studio. He remained here working until 1953 before retiring. His studios were all a fair way from the sea-front, so Bailey probably relied on kiosks as well. 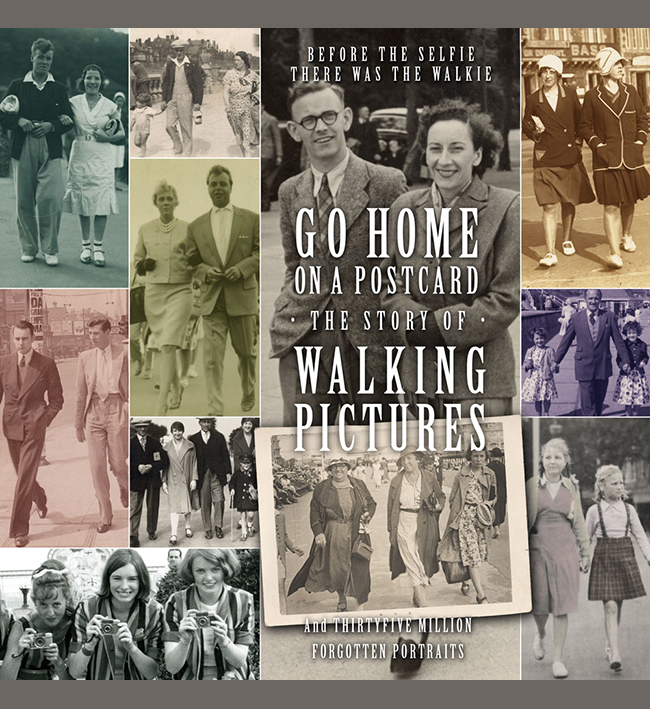 Along with the walkies, Bailey busied themselves with all sorts of photographs. 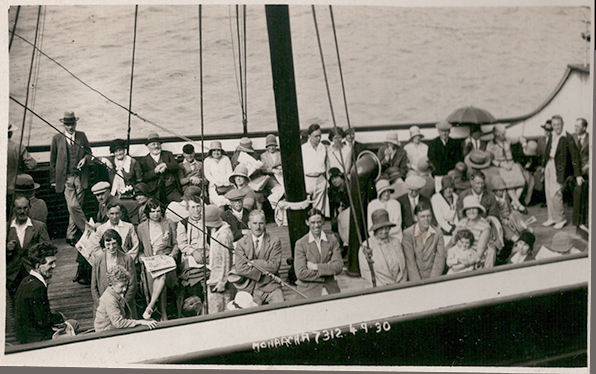 There were standard tourist view cards sold through local shops, but the firm is probably best known for snapping steamer departures from the pier, the decks packed with passengers. These images must have been taken on large format negatives, and are of excellent quality, useful when trying to capture so many people and retain sharpness. These boat trips were often to the Isle of Wight, so it is likely Bailey could have prints waiting when the ship returned. The photographers for the firm would also venture onto the beach to photograph groups of people in deck chairs, in the sea, or on the promenade. Bailey walkies seem to be his only foray into individual street portraits (though do contact us if you have seen others). 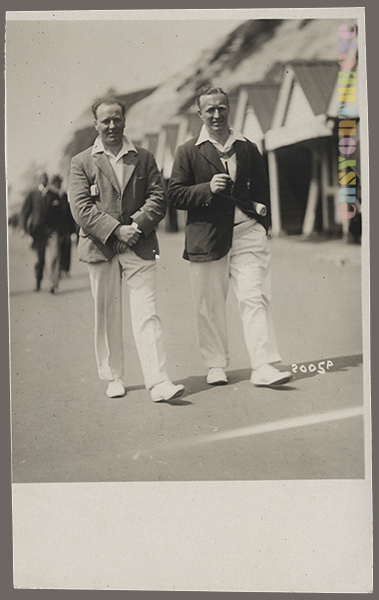 They are usually very good quality indeed as the examples here from our archive show (the second photo is dated 1932). 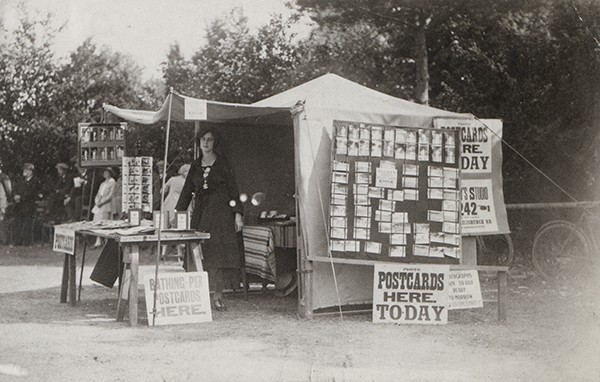 A great image of a tent selling Bailey’s photographs has survived, albeit undated. It looks to be from the 1920s. Baileys also later operated a kiosk on the promenade, west of the pier. As you might imagine, Bournemouth also supported other walking picture firms. Known rivals include Cinema Snaps by Robinson and Harris; Sunfilms (small half postcards sized images from the late 1940s, early 1950s); Beach Photos and Movie Films, both sold by George Coleman from 10 Royal Arcade, Boscombe; Emmerson, from West Beach, and other as yet unidentified pre and post-war photographers. All three of the Bailey studio premises seem to survive, albeit now given over to other uses. An article about another Bournemouth photographers is on the site here, and a post about one of Bailey’s crowd views here.